New CANDELS GOODS-N Mosaics; Epochs 8-10, Include Exposure-Time Maps! Example co-add spectrum from the IUE WD Atlas. Click for full resolution. An atlas of IUE Echelle spectra for 55 white dwarfs was created by Jay Holberg and collaborators (Holberg, Barstow & Sion 1998, ApJS, 119, 207). The project created order-combined and epoch-combined, high-resolution Echelle spectra of the sample of white dwarf stars observed by IUE. In particular, their epoch-combined spectra resulted in higher signal-to-noise compared to the individual visit spectra. File names have been changed, they no longer match the Holberg et al. archive file names. Data structure has changed, the spectra are now stored as binary FITS tables in the first extension. Additional metadata (coordinates, star identifiers, exposure times) have been added to the primary header from the original NEWSIPS .mxhi files. The spectra themselves (wavelength, fluxes, flux errors, quality flags) are exactly the same as the original Holberg et al. archive. A link to a translation table between the new MAST file names and the previous Holberg et al. archive file names is provided on the project's HLSP page so that published papers referencing the older file names can be properly tracked to the new file names. 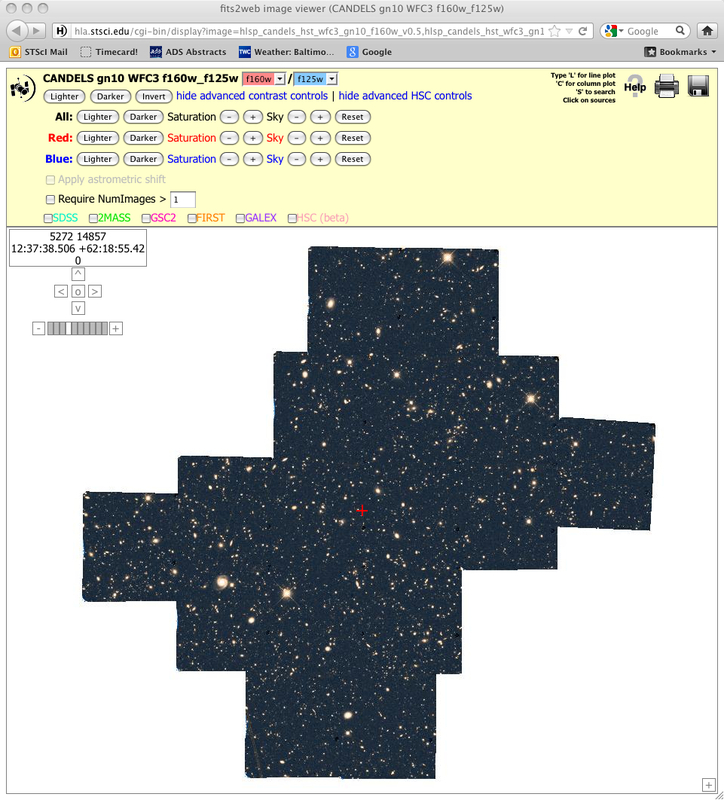 The HLSP page also contains a detailed description of the file format and header keywords, a table listing the white dwarfs that comprise the atlas, and, within that table, quick links to download the FITS files or launch an interactive plotting tool to explore the spectra before downloading. Example interactive display for Epoch 10 of the GOODS-N field. Zoom, overplot source catalogs, adjust contrast and more. The CANDELS team has released new mosaics for the GOODS-N field, consisting of the v0.5 release for Epochs 8, 9 and 10. The project has now delivered high-level mosaics for a total of 806 orbits, or about 90% of its overall allocation of 902 orbits, during the past two years. Over 2.5 TB of high-level science mosaics have been delivered by the CANDELS team to the MAST archive, while over 33.5 TB of these mosaics have been downloaded to date, to 1128 distinct IP addresses. This release also provides exposure-time mosaics (*exp.fits), corresponding to the total integrated exposure time at each pixel (after having accounted for geometric distortion and the difference between mosaic pixel size and the detector pixels). These mosaics are necessary to convert the drizzled science images (which are in electrons/second), into the total number of electrons for each pixel on the sky. This is valuable for calculating the signal-to-noise ratio of sources, since the photon noise from each pixel in the source can now be accurately computed. In addition, the exposure time maps can be used for carrying out detailed source count simulations of the CANDELS fields. For example, they can be used to calculate the expected number of objects observed in each of the different filters, for various models of galaxy evolution and spectral energy distributions, and thereby enable a direct comparison with the observed number counts. The new mosaics, consisting of the usual drizzled and inverse variance weight files, and now also including the exposure time mosaics, can all be downloaded from the main CANDELS webpage, under the section for the GOODS-N field.